You’ll be glad you booked this Surfers Paradise resort accommodation. These spacious and well-appointed fully self contained 1 and 2 bedroom apartments at the Baronnet Apartments are located just fifty metres from the local beach, and are within walking distance of Surfers famous Cavill Mall. This really is the epicentre of Surfers Paradise and positions you and your family for the truly quintessential holiday in Surfers Paradise. Just past the beach you’ll find the clubrooms of the Northcliffe Surf Life Saving Club on Garfield Street, but these aren’t your average Gold Coast surf club digs. Enter their award winning Surf’s Up restaurant and you’ll be taking your tastebuds down memory lane. It is open for breakfast, lunch and dinner, seven days a week, with classics on it’s menu like chicken parma, crumbed schnitzel and pizza, pasta, burgers, steak but also updated with a range of Asian dishes. At less than a five minute walk away, it’s a fun lunch or dinner for the family. The Baronnet Apartments resort facilities include a lushly tropical-themed outdoor entertainment area and will be a family favourite hangout. Relax on a sun lounger under a palm and enjoy a long cold drink with a book, or take a dip in the pool. Unwind after a gruelling day of shopping in the spa that is beside the pool. The superb undercover outdoor dining furniture is good for al-fresco meals and it’s right beside the BBQ grill. Does it feel like the Gold Coast yet? If you are looking for fresh fields to conquer, there are plenty of Gold Coast destinations to visit, and Surfers really is the perfect hub for you Gold Coast holiday experiences. If you have a young family the parklands of Kurrawa Park and Pratten Park with public BBQs, covered children’s playgrounds and play areas and walking and cycling pathways makes a great day out. The kids will be entertained (mostly for free) and you can relax. Not far away is the Pacific Fair Shopping Mall, the largest of it’s kind in the Southern Hemisphere, and it’s down the beach in Broadbeach. Don’t just stop there, The Star Casino is also good for dinner and a floor show. If it’s whale watching season, Burleigh Heads is a great place to view the migrating humpback whales. It’s also a great picnic spot too. 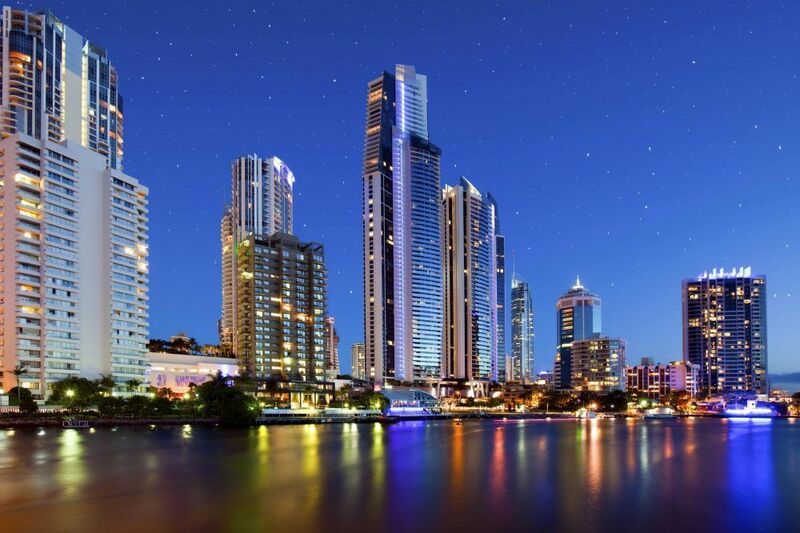 Wherever you go on the Gold Coast, there’s one thing you can be sure of, you’ll be glad you booked this Surfers Paradise resort accommodation at the Baronnet Apartments. Don’t just dream it, book it.